Where have all the liberal Republicans gone? Last night as you watched (if you did) the Republican "debate" on CNN, and heard the war-mongering careless threats to the well-being of people in the US and by extension many people in other countries, did you wonder what happened to the liberal wing of the Republican party? Have you ever wondered where they went? Not just Jacob Javits and the more memorable senators, but quieter people like Senator Clifford P. Case from New Jersey? A man of real integrity and now New Jersey is run by a lying thug who has destroyed much that was good in his state in gov't and is now running for president? We are encouraged to imagine the people who supported the liberal Republicans just melted away somehow; that a new spirit was abroad (note how un-concrete that kind of phrase is) and all these people "took a turn towards the right," or that seeing the election of these crazys and fearful of religious fanatics, intelligent Republicans who were not CEOs of corporations or their patsys gave up, became democrats, or they stopped voting. The last is laughably unlikely among the older generation (people over 50 say). Or they are outnumbered by religious crazies and bigots and ignorant people. Fled in distaste from primaries? Why? such people would have the same aggressions, intensities, desires for places on boards, committed beliefs as anyone else? 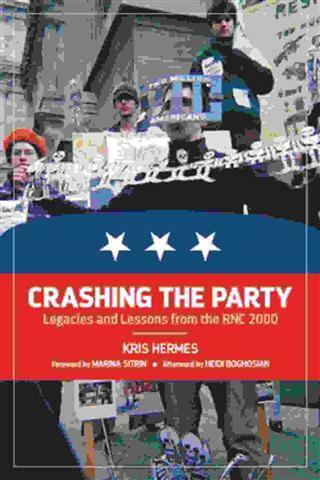 Well here's a book that tells the slow process actively working, undermining all individual causes, for the last 2 decades: Crashing the Party: Legacies and Lessons from the RNC (2000) by Kris Hermes (PM Press, 2000). Hermes's literal topic is about the fierce state and city response to the GOP National Convention in Philadelphia 15 years ago. The city instigated in part by hugely-funded corporations who wanted a Bush to win, enlisted the city and its brutal military police to fence in and then do mass arrest to stop all peaceful street protests. McCain supporters were to be stopped from any demonstration. There were of course also there many dissidents from left-wing groups meaning to protest severe right-wing domestic and foreign policy. They were ejected from the building. There were "preventive" police raids on in the area (whatever happened to the bill of rights?). Most of the time when people discuss police brutality, the support and collusion of state agencies, the instigation of these to act by corporations the people brutalized, arrested, maimed, the subject is leftists: civil rights activists in the 1960s, Black Panthers in the 1970s, in the 1990s environmentalists (now called "eco-terrorists" by some courts); recently the Occupy Movement, now Black Lives matter, anti-nuclear power activists for decades, to go back in time the Suffragettes in the early twentieth century and before that native people's in colonized countries. So attention is focused on these groups, not on the way they are crushed. You pick a scapegoat, like the woman who tried to defend herself against a police officer in the Occupy debacle in NYC. She was physically abused in prison, tried to use the system (lawyers) to obtain right and justice, but found she could not. We have not heard about her since. But these methods can be and are used to destroy middle-of-the-road groups just as strongly, and importantly. 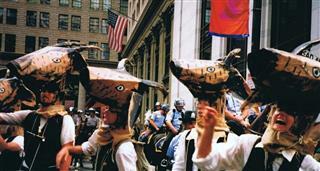 According to Seth Sandronsky in a review of Hermes's book, a central learning experience occurred in 1999 during a World Trade Organization meeting in Philadelphia, where the city's ostensible (and open) motive was money: the city said they wanted tourists and consumers to feel safe and welcome, to bring money in "for all." (I was told last night by someone on the board of a University committee that universities are now real estate businesses; there to make money off their real estate and make people pay big sums for time.) Sandrosky: Business matters .... Behind the GOP rhetoric of free markets and liberty, the political power of business shapes the capitalist state and public policy." The subject of Hermes's book is the methods of repression themselves and how they are used against all kinds of protest, depending on who wants the particular group silenced and where. Once you repress and terrify people in the streets, then you treat them pitilessly in jails. Someone is disruptive in a literary convention? for some literary-academic quarrel over who shall run this or that? Arrest him or her or them promptly. Remove all signs of protest. Then there is the use of extreme charges, long sentences if the person does not admit to guilt and "plea bargain", high bail. The people who are part of movements are often highly individual and not organized and there for different individual reasons. It becomes easy to disperse them, and hard to organize them into effective working groups who sustain themselves. Then you make sure the media tells the story in such a way as to castigate and isolate the protesters. In the face of such treatment the ordinary person who has a job to go to the next day, a home to protect, people to support, is relieved to be allowed out. Solidarity as a concept is given no play in the media (associated today with unions, very bad, or communist Poland). Civil litigation is a slow process. There is no or little provision for lawyers for poor or middling people. Lawyers are expensive. (I know this from personal experience.) Liberal republicans were middling people who had reputations to protect, who were not given to street-fighting, calling attention to themselves; being beaten up was deeply shameful. And many did have middling and higher positions in corporations to protect. Perhaps the most important of these (people on state and city boards). "At the same time, these events also provided a laboratory for the radical, innovative, and confrontational forms of legal support carried out by R2K Legal, a defendant-led collective that raised unprecedented amounts of money for legal defense, used a unique form of court solidarity to overcome hundreds of serious charges, and implemented a PR campaign that turned the tide of public opinion in favor of dissidents. While much has been written about the global-justice era of struggle, little attention has been paid to the legal struggles of the period or the renewed use of solidarity tactics in jail and the courtroom that made them possible. By analyzing the successes and failures of these tactics, “Crashing the Party” offers rare insight into the mechanics and concrete effects of such resistance. In this way, it is an invaluable resource for those seeking to confront today’s renewed counterintelligence tactics." So the next time you find yourself watching as a set of Republicans to choose from people advocating dangerous, counter-productive cruel (to US soldiers too) policies abroad, immiserating Americans at home by taking from them access to affordable health care, pensions, places to live, selling off state-owned parks and resource rich land, and wonder why there are not decent people running for office as Republicans, remember what we watch occasionally being done to immigrants and liberal and left- and women's movements, black and poor people in the streets on TV. The quieter semi-liberal groups didn't just melt away in just the way the people in the Occupied Parks didn't just disappear. Of course the choice of states to run primaries in is deliberate too? why New Hamshire instead of Vermont? Why Iowa? "Over the past 15 years, people in the United States—and dissidents in particular—have witnessed a steady escalation of the National Security State, including invasive surveillance and infiltration, indiscriminate police violence, and unlawful arrests. These concerted efforts to spy on Americans and undermine meaningful social change are greatly enhanced by the coordination of numerous local, state, and federal agencies often operating at the behest of private corporations. Crashing the Party shows how these developments—normally associated with the realities of a post–9/11 world—were already being set in motion during the Republican National Convention protests in 2000. It also documents how, in response, dissidents confronted new forms of political repression by pushing legal boundaries and establishing new models of collective resistance. <em>Crashing the Party</em> explains how the events of 2000 acted as a testing ground in which Philadelphia Police Commissioner John Timoney was able to develop repressive methods of policing that have been used extensively across the U.S. ever since. At the same time, these events also provided a laboratory for the radical, innovative, and confrontational forms of legal support carried out by R2K Legal, a defendant-led collective that raised unprecedented amounts of money for legal defense, used a unique form of court solidarity to overcome hundreds of serious charges, and implemented a PR campaign that turned the tide of public opinion in favor of dissidents. While much has been written about the global-justice era of struggle, little attention has been paid to the legal struggles of the period or the renewed use of solidarity tactics in jail and the courtroom that made them possible. By analyzing the successes and failures of these tactics, Crashing the Party offers rare insight into the mechanics and concrete effects of such resistance. In this way, it is an invaluable resource for those seeking to confront today’s renewed counterintelligence tactics." I rarely put book reviews on this blog any more, but given the present state of the presidential campaign and unending wars, thought I should notice this one. How do you define oppression? It's the undermining and disabling from effective work or fulillment of a particular group of people. The word disabling reminds me of how disabled people unless supported by non-disabled people dare not, cannot go the streets to demonstrate.